OMG. This might actually be my favorite dish that I’ve made thus far… It’s light and rich at the same time, filling and flavorful!!! I found this recipe and tweaked it based on what I had available. I also add more of this and less of that, so play around with it until you’re happy with the taste. Do yourself a favor and try this one out one night!! Combine rice, coconut milk and a pinch of salt. Cook it, ideally in a rice cooker or on the stovetop. I just put the rice from the bags in a saucepan on the stove with the milk and added the chicken later. I also added a bit of pepper. Toast your almonds & coconut flakes (separately) in a small skillet, or in the oven just until they begin to look browned. Set aside. Once the rice is nearly done, start your veggies. In a large skillet over low heat, add oil, and garlic. Once it’s fragrant, add the kale, edamame, scallions, few good pinches of salt, and turn the heat up to medium. Cook for just a few minutes until the kale starts to wilt down. Add lime juice & zest, and turn the heat off. Add the rice to the skillet and give it a good toss and toss in the cilantro. Taste and adjust. 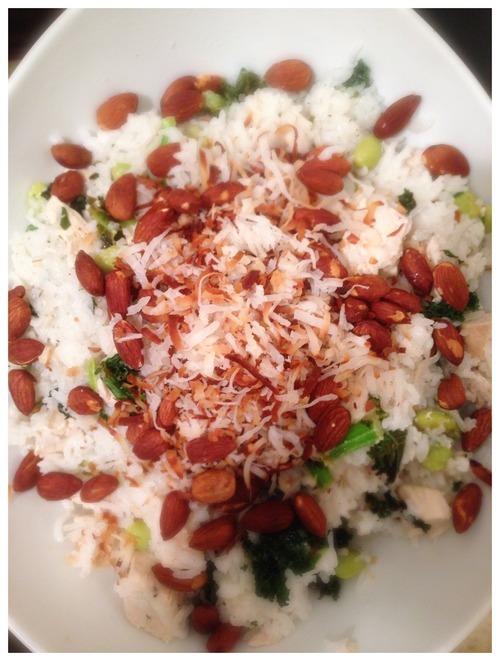 Top with toasted almonds and toasted coconut flakes and serve.